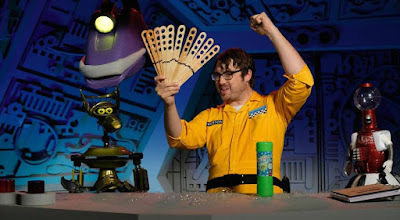 Mystery Science Theater 3000 ran from 1988 to 1999 while airing on Comedy Central and Sci-fi channel. Now it airs on Netflix thanks to one of the most successful kickstarters in the company's history. When Joel Robinson (played by show creator Joel Hodgson) is shot into space and forced to watch bad movies while mad scientist Dr. Clayton Forrester (Trace Beaulieau) and his crony, TV's Frank (Frank Conniff), monitor his mind, Joel builds a cast of lovable robot sidekicks to help keep his sanity: Crow, Tom Servo, Gypsy and Cambot. It's only through their wisecracks, quips and friendships that they make it through a barrage of increasingly terrible cinema--and the audience in turn gets a veritable treasure trove of gut-busting hilarity. The new MST3K, Produced by original creator Joel Hodgson, features a litany of geek all-stars like Felicia Day as Kinga Forrester and Patton Oswalt as TV's Son of TV's Frank, the show’s 11th season has the look and feel of classic MST3K. Jonah Ray as Jonah Heston, the latest kidnapped bad movie victim, along with returning “bot” companions — Baron Vaughn as Tom Servo and Hampton Yount as Crow.